Tofino is where wilderness and luxury meet. It’s a wave-washed destination where even the public campgrounds are never far from million-dollar views. John Platenius is the parent of two children (ages 5 and 7) and a resident of Tofino, a top summer vacation spot along Vancouver Island’s western shore. Platenius has just put out a fine new book on the region, Tofino Guide , retailing for $19.95. Read more at his Tofino-focused website or leave questions below in the comments. 1. Can you recommend a good Tofino hotel, if you’re staying with kids? Platenius: Oh oh — prepare yourself for long answer, because there are so many great hotels and resorts in Tofino. Most people come here for the beaches, so it’s a natural fit to recommend a place located on one of the beaches. I can truly say that you can’t go wrong by any of the hotels and resorts that are located on a beach. 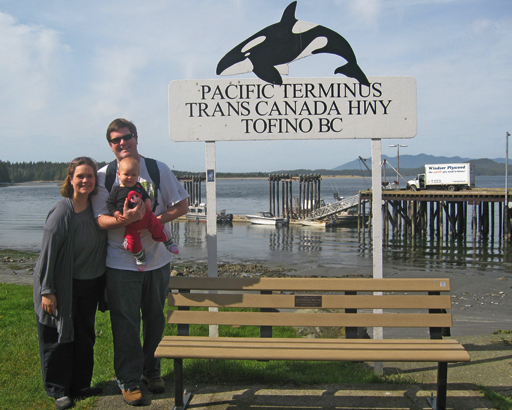 For many families visiting Tofino, price is the main determining factor. Luckily for budget travelers, our peak season of July and August is relatively short, and there are incredible deals outside of these months. If adventurous families want to come to Tofino in the winter months, they can find a room or even a cabin at a luxury resort for $100 per night — and that’s for a stupendous beach location with cushy amenities! The most established family-oriented hotel and resort on the beach is Pacific Sands Beach Resort. It’s located on Cox Bay and is a great choice. But it really comes down to taste and what’s available at the time. Pacific Sand’s neighbors, Cox Bay Beach Resort and Long Beach Lodge get rave reviews and are equally stunning in terms of location and amenities. Chesterman Beach only has one hotel, the Wickaninnish Inn. The Wick is a Relais and Chateâux property and it’s the definition of luxury. My family goes there for coffee fairly often to take in the incredible atmosphere and feel special. If price is not your determining factor for accommodation, I would recommend it in a heartbeat. They have a kid-friendly special called “Wick Kids” which has a kid-version of a gift basket and they offer complimentary child care when guests dine at their restaurant perched over the Pacific. And then there is MacKenzie Beach, which has two places that I often recommend — again depending on the price and need for amenities. Middle Beach Lodge is an established resort that offers an out-of-this world experience. It was built with heritage materials and is appointed with marine antiques and artifacts that create a warm and relaxing mood. The owner likes to quote a writer who visited there and said “Ralph Lauren would be happy here,” and I too think that’s a great description. Middle Beach has a good approach to welcoming kids to a resort, with family-specific cabins, which are located a great distance from their adult-specific lodge. It’s a 40-acre property, so there’s lots of room for everyone. The last place I’d recommend on the beach is Ocean Village Beach Resort on MacKenzie Beach. It was recently purchased by a green development team that revitalized the property. It is one of the few places in Tofino that has an indoor swimming pool. It also has an expansive lawn that leads down to the sandy beach, which makes it very attractive to families with wee ones. OK – there’s one more on MacKenzie Beach that I should mention: Crystal Cove Resort. This place has an awesome private play park for kids. While it is mostly set-up for RVs, they have some really nifty cabins for rent that are built up on stilts, so it feels like your sleeping in a tree fort. It’s also important to point out that many families choose to stay in vacation rentals — entire houses that have been set up for nightly rentals. My family loves to stay in a vacation rental when we travel, because we can cook our own food, and the kids have more space to roam around and play freely. Most of the resorts that I mentioned above have cabins that they rent in this fashion and there’s two large vacation rental management companies in town: Tofino Vacation Rentals and Tofino Beach Homes. Additionally there are over 100 privately owned vacation rentals in Tofino, so there are tons of options available. 2. 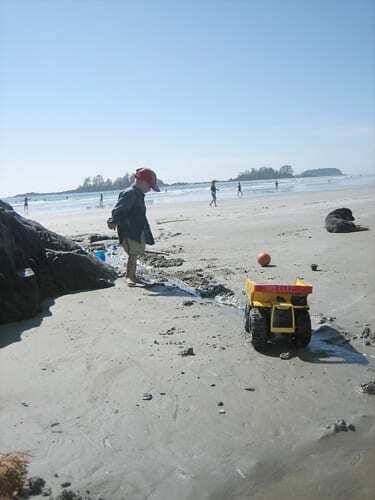 Which beach is the best for toddlers or preschoolers visiting Tofino? Platenius: In my mind, all beaches are great for young ones. Exploring, digging, boogie boarding, skipping rope with bull kelp — what fun! 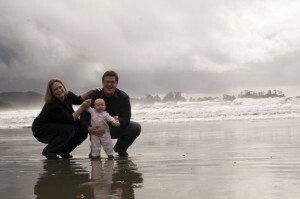 In Tofino Guide, I recommend MacKenzie Beach as the calmest beach for toddlers looking to wade around in the water. It’s relatively protected from the swell and wind, which generally makes for calmer water. There’s also some spectacular tidepools at one end of the beach that make for wonderful exploring if it’s a low tide. Kids love to squish their fingers into sea anemones and giggle as the alien-like blob squirts out water and closes it’s tentacles. 3. 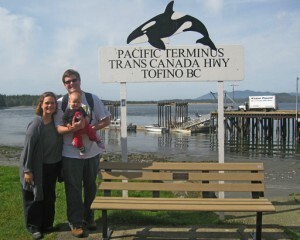 Can you recommend any family Tofino/Ucluelet restaurants where you can take kids? Platenius: Ooooh. That’s a tough one. Most of the restaurants in Tofino are attractive for families, and all of them are good. Three come to mind, and I’ll explain the perks of each. All three give crayons and have kid-friendly choices. SoBo — which stands for Sophisticated Bohemian — is run by parents of two young ones, so it’s a natural first choice. The owners recently commissioned a local father to build an attractive but functional play toy for kids to use on their patio. He built a mini replica of the purple bus that they used to operate out of when they first opened and it’s a great draw for kids. Our kids love to eat lunch at this restaurant, and they usually order a kid-friendly version of their miso oudon noodle soup. SoBo’s polenta fries are practically a staple for many Tofino families. Shelter Restaurant is another great choice for kids, especially for lunch. It’s a bit darker, and more lounge-like than the other three, which I think can be fun for kids to experience. They have the best booths in Tofino — big and cushy. They also play surf movies on four or five TVs, which my kids love to watch. The kid’s pizza there is a great choice. And then there’s the restaurant at the Weigh West Marine Resort, which has been around for a long time. It’s perched right over the water on wooden pilings, so kids can lean over the window and watch the marine life below. It’s common to see river otters and sea lions swimming right by your window, and you can watch the star fish clinging to the pilings. You are literally dining in an intertidal zone! The kids fish and chips is great, and it’s a good value too. 4. What is your favorite hiking trail in the area (that would be suitable for a family with young kids), and why? Platenius: The Rainforest Trail, Loop B is my first choice. It’s about one kilometer long (0.6 miles), which I find a perfect distance for my 5-year-old daughter. The entire loop is boardwalked, which makes for easy walking, and there are great interpretive signs about the temperate rainforest ecosystem. One section of the trail crosses a ravine by way of a huge log that fell who-knows how long ago, which impresses the kids and the adults in the crew. 5. 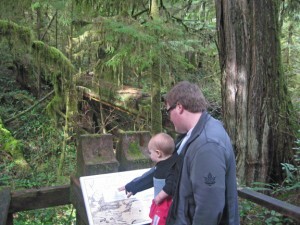 Can you recommend a favorite family-friendly campsite near Tofino? Why is it good for kids? Platenius: Before I answer this one, I should mention that if families are looking to camp in Tofino in July or August, they should make reservations well in advance. All of the campgrounds are family friendly, but I think Green Point Campground, in the Pacific Rim National Park is probably the top choice for families. It’s situated up above Long Beach, which is about a five-minute walk from most campsites. The reason I choose this one is because it gets you away from it all, but still has all the amenities you’d expect at a campground. Because it’s in the National Park, it’s significantly cheaper than the others. There’s a theater in the campground that hosts naturalists and park staff who present evening shows on topics like black bears, gray whales and the local indigenous culture. Smart Vancouver families in the know have already made their reservations for Vancouver Island. Want to play catch-up? I pulled together a selection of ultra-deluxe Vancouver Island resorts and affordable family accommodations, as I’m doing my own research for a trip through Vancouver Island. I found plenty of resorts where children are definitely NOT welcome; one said that kids were welcome to use the pool — for exactly three hours per day! I’ve mostly listed upcoming high season prices. On Vancouver Island, high season runs roughly from June 25-early September. Shoulder seasons will offer savings between 10-25%. Winter season will offer discounts of up to 25-50%. You’ll find a similar pricing structure when you go to book your travel via BC Ferries, which offers car, pedestrian and bicycle transportation to Vancouver Island and the Gulf Coast Islands. View Vancouver Island on a larger map. Photo above: Courtesy of Pacific Sands Beach Resort, Tofino, British Columbia. 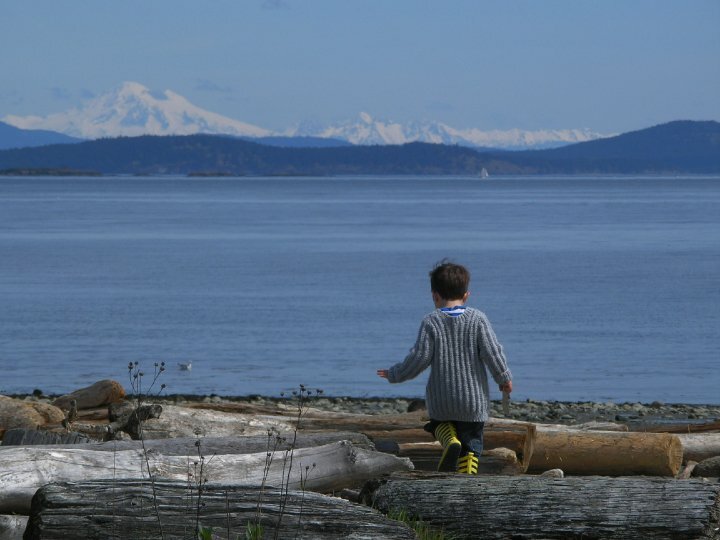 This is the most popular Vancouver Island beachside town for families. Featuring warmer water, sandy beaches, easy access to Vancouver and Victoria and plenty of family activities, Parksville serves up a treasure of a destination. Tigh-Na-Mara Seaside Spa Resort. On the eastern coast of Vancouver Island, this family resort boasts full-fledged family packages, an outdoor playground and indoor pool, plus 3 kilometres of sandy beach. Many cottage-style and suite-style units provide full kitchens and spacious living areas for family relaxation. To top it of, Tigh-Na-Mara offers kids-eat-free hours (5-6 p.m.) at the restaurants, a children’s menu, coupons for free activities, children’s playground and a free summer drop-in children’s program. Rates: From $207/night in high season (summer). Beach Acres Resort. Near the mild-mannered Rathtrevor Beach, this Parksville kid-friendly resort hosts families in cottages and townhouses, while entertaining kids of all ages. Weekday activities for kids ages 5 and up include craft afternoons, pizza and movie nights, family camp fires with s’mores; for kids age 10 and up, there’s mini-golf adventure, sports tournaments and pizza and movie nights. There’s an indoor pool, lots of sports activities (volleyball, tennis, badminton, horseshoes! ), and a children’s playground. Rates: From $259/night in high season. Ocean Trails. For active family vacationers who don’t need many services, Ocean Trails may be one of your best options. This resort lays out multiple sports activities (basketball, tennis, volleyball) on-site, offers a children’s playground, is surrounded by 7 acres of green space. You’re close to Rathtrevor Beach, and rates here are lower than many other resorts. No restaurant available, so bring your own food for your kitchen-equipped condo. Rates: From $149/night in high season. Beach Club Resort. Just steps from your hotel room, you’ll wade into the warmest ocean swimming water in Canada. Explore marine life in the tidepools or create sandcastles on the wide, flat beaches. If it’s a rainy day out, dive into the indoor pool or relax in your room (1 and 2-bedroom, villas and suites available). Babysitting/child-minding services and a children’s menu available. Rates: Start at about $300/night. Campbell River is known as the “Salmon Fishing Capital of the World,” but it doesn’t just reel in fish fanatics. Head here for wildlife-watching, farmers’ markets and a laid-back lifestyle. Painter’s Lodge. Painter’s Lodge attracts fishing enthusiasts but welcomes children as well. Kids can play the Wii in the activity centre, pick up their kids’ package upon check in (it contains a coloring book and other little things) or meet a childminder or babysitter if the parents are off on a fishing excursion. A tennis court and outdoor pool are keep-em-busy options when the weather’s nice. A solid family accommodations option: the large loft-style room featuring two twins upstairs and a queen bed downstairs. Rates: From $148/night in high season. With working-class villages and whale-watching opportunities, North Vancouver Island’s quiet, rugged pleasures are perfect for a low-key vacation. Telegraph Cove Resort. Most families coming this far north up Vancouver Island are here for whale-watching, kayaking and hiking. Set down your tent on the resort’s campground, or settle in to one of the eclectic cabins, houses or inn-style rooms (the resort is at the site of an early-20th-century village). You won’t find anything catering to kids beyond a swingset on a field and a few puzzles, but the diversity of affordable, family-friendly options make the resort a solid bet. A short drive from Port McNeill. Rates: Start from $220/night. On Vancouver Island’s wild Western shore, you’re far from manicured beaches and tamed nature. So it’s obviously a perfect place to bring your hyper toddler or run-all-day preschooler — once you manage the long cross-island drive. 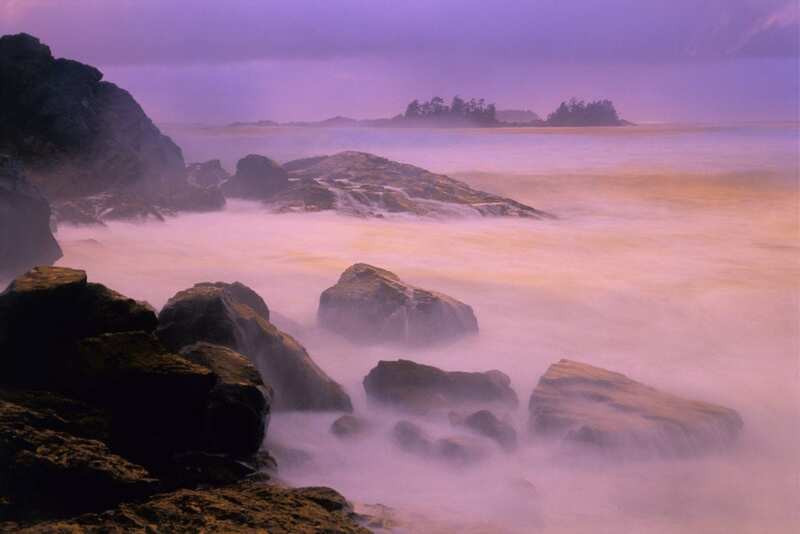 Tofino offers upscale, world-renowned resorts for adults and children alike. Pacific Sands Beach Resort. This resort’s free kids camp starts at 9:30 a.m. daily and runs six days per week from July through Labour Day Weekend. Camp activities include crafts, scavenger hunts, musical instruments from seashells, sealife identification, sandcastle-building, and marshmallow roasts. Suites and villas range from 520 to 1,400 square feet – plenty of room for families. Look for the family getaway weekend packages. Rates: From $285/night per night. Crystal Cove Beach Resort. You’ll find a nice mix of pet-friendly accommodation options at Crystal Cove. Over 30 modernized (wifi! wood-burning fireplaces! DVD players!) 1- and 2-bedroom log cabins await families looking for a splurge, while 72 serviced sites welcome RVers on a budget. Kids can play near the warm-ish MacKenzie Beach or enjoy the resort’s deluxe kids’ playground, featuring swings, teeter-totter, sandbox and more. Rates: From $290/2 people per night in high season; children 3 and over are an extra $10/night. RV sites start from $55/night. Clayoquot Wilderness Resort. A very different kind of West Coast adventure awaits you at Clayoquot Wilderness Resort. Families come to this summer-only spot to enjoy the all-inclusive atmosphere, which includes airfare from Vancouver, your stay in a luxe outpost tent, all activities (there are over a dozen, including bear-watching, kayaking, horseback riding, fishing, cooking classes, archery). Oh, and possibly even a massage or two. Older kids, tweens and teens get the most out of a stay, as they can go on excursions while you relax into a massage or traipse off on a different excursion. It’s not cheap; all-inclusive weekly rates easily run into the five digits. Rates: From $4,750 for three nights, all inclusive, airfare included. Long Beach Lodge Resort. This resort doesn’t offer an indoor pool, but does provide the “Surf Club,” where children learn how to surf from a private instructor (for an additional fee). Other kid-friendly amenities: Toys to borrow, a family movie library and children’s board games. Cottage rentals include a hot tub on the back deck. Children eat free off the Great Room’s kids’ menu, when dining with parents at the 5:30 seating. Rates: From $319/night. Color abounds in this eastern Vancouver Island community, from wildflower-dotted mountains to artwork in one of the region’s seaside villages (Comox, Courtenay). Old House Village Hotel and Spa.These budget-minded one-bedroom Courtenay suites provide full kitchens for your in-room cooking ease. Kids can enjoy nearby beaches and the Comox Valley Aquatic Centre (a 5-minute drive away), plus the outdoor heated pool. Rates: From $149/night in summer. These tiny islands are accessible from Vancouver Island, and attract visitors seeking a bucolic, farm-dotted region full of artisan outlets. Come here to kick back in a sub-Mediterranean climate and soak up the island lifestyle. Poet’s Cove. Stay in a Pender Island cottage or villa for plenty of family room, then head outside for pooltime (one pool is reserved for adults only, the other pool is all-ages), tennis courts, basketball, ping-pong tables, and a mini-playground with slide and swing. There’s a kid’s camp (weekends only until July, then daily throughout July and August) with fun crafts and activities. Rates: From around $300/night in high season. Salt Spring Harbour House. While this Salt Spring Island resort doesn’t offer a pool or playground, it does provide the ultimate chilled-out island experience, right on an organic farm. Visit the farm’s goats and gardens, then hop in the car for a 5-minute drive to Salt Spring’s playground and the Rainbow Road Public Pool. Under 12-year-olds stay free. Rates: From $135/night in summer high season. Vancouver-based mom Elaina Spring Eden, husband and adorable 9-month-old daughter Ava just traipsed off to Tofino, BC for almost a week. Tofino — located off the west shore of Vancouver Island — is well-known for opportunities to hike, whale-watch and unwind from the world. But that last part (unwinding) isn’t always so easy for new parents, as we all remember. Q. 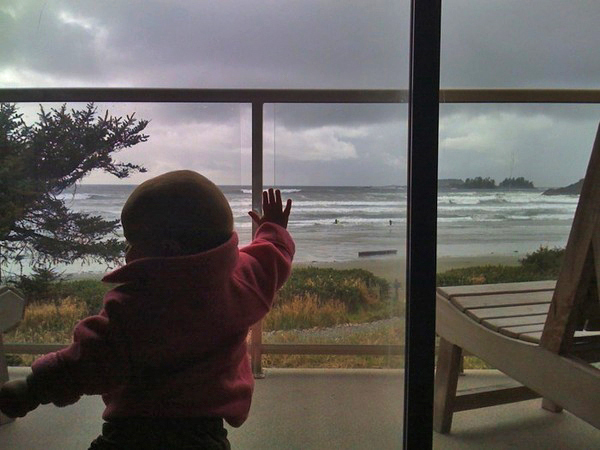 Did you stay in any kid-friendly Tofino hotels on Vancouver Island? The first three nights we were at the Long Beach Lodge. Overall, the property was kid friendly. They happily provided a pack n’ play and high chair for our room. However, if you are traveling with little ones, I highly recommend one of their two-bedroom cottages over the beachfront rooms in the lodge. It is nice to have the privacy and the extra space (1,000 sq. ft) as well as a full kitchen. We put baby upstairs in a pack n’ play and enjoyed having the entire downstairs area to ourselves after she went to bed. There is a gas fireplace as well as a private hot tub off the master bedroom. We used the BBQ one night and ordered food to go from their restaurant another night (they don’t offer room service). I emailed in advance to make arrangements for a babysitter one evening. It was $15 an hour and allowed us to enjoy a nice dinner in their restaurant that was not particularly family friendly in the evenings. We also stayed two nights at the Wickaninnish Inn. In a word, it was amazing. Their attention to detail was truly extraordinary. Riedel stemware in our guest room, homemade butter with every meal, cedar carving lessons, rain jackets, pants and boots, a hybrid Lexus for borrow, the world’s best hair dryer, HBC wool beach blankets, a caring smile at every turn and breathtaking scenes of rain forest, rock and ocean. The staff could not have been more accommodating and courteous. We were in a fairly standard “deluxe” guest room and it was extremely spacious and absolutely lovely. The bathtub was enormous and provided our baby girl hours of enjoyment. It was as if she had her very own swimming pool! They also provided a microwave in the room, which made heating up her baby food a breeze. On their third floor they have a wonderful little library with all kinds of children’s books, puzzles, games and videos. Perhaps the best part for us was the complimentary in-room childcare for guests who wish to dine at the famous Ponite Restaurant. We were fortunate to experience the chef’s five course tasting menu during our visit and it was simply amazing truly incredible. The meal was simply amazing. We also ordered room service a couple of times, which was just as delicious. I was impressed that they came to our room four times to bring us our dinner in courses: appetizer, starter, entree and dessert. It was expensive but I have to say the return was worth every loonie. This is the ultimate “family friendly five star” resort in British Columbia. We also spent one night in a cabin at the Tigh-Na-Mara Resort in Parksville. This place prides itself on being family friendly and it shows. We stayed in a private cabin that was adorable and had everything we could wish for, including a full kitchen (with a dishwasher and microwave), a back deck with a private picnic table and BBQ, and a wood burning fireplace. The resort itself has a link on the website for “families” and features several different organized activities, programs and amenities for kids. We used their babysitting service to visit the spa and have dinner and were extremely happy. The restaurant is also 100% kid friendly for all meals. Apparently it is also a great place to bring the family during the winter holiday season. I had no idea how easy it was to arrange an in-room baby sitter at each of these properties. What a pleasant surprise! Q. Some families would be worried to leave their baby with a babysitter they’re unfamiliar with. What reassured you? Regarding the babysitting service, it was easier than I thought it would be. I did some research in advance and all three resorts have such a good reputation it immediately gave me some confidence. It also helped that I knew we were just a few moments away on the same property. The Wick and the Long Beach Lodge interview and train existing in-house guest services staff to provide childcare. At the Tigh-Na-Mara Resort they also hire and train staff. As noted on their website “All of our sitters have been interviewed by Tigh-Na-Mara and have their Babysitting Certification. Babysitters will provide their own transportation to and from the Resort. Children under the age of two years require a mature sitter, 18yrs and over.” The person who looked after Ava was the mother of the woman who ran the hotel gift shop. She was delightful. We were truly happy with all three babysitters. My advice is to trust your gut instincts when the sitter arrives and if everything feels okay … escape and enjoy a leisurely two-handed paced meal. You will be so glad you did. Q. Did you eat any memorable Tofino meals? Did you find a great baby-friendly or kid-friendly restaurant in Tofino? A friendly mum on the ferry recommended we try Sobo while in Tofino and I am so grateful. It was a bit hard to find (a couple of blocks off the main drag) so it isn’t a place you would just stumble upon but it is definitely worth seeking out. Not only was the food fresh, local and seasonal, but the restaurant is perfect for families. There is patio with a play area for kids as well as some fun picnic tables. Our server (also the mother of a nine month old) was incredibly kind and even offered to bring out some special “baby friendly” food for Ava. They also offer all kinds of items pre-made and ready to take-away. Their fresh cookies and other decadent desserts are to die for. Q. Which family-friendly activities you enjoy with your baby daughter, in Tofino? One cool thing we did was hire a professional photographer to take some family shots. The scenery is so extraordinary that we simply couldn’t leave without capturing it. We worked with local photographer Christopher Pouget and he was great … personable, professional and patient. His price was extremely affordable and his images are priceless. Another fun thing was the “Rainforest Walk” in the Pacific Rim National Park. The path we did was an easy half hour journey on a raised boardwalk. It is not stroller friendly but we managed beautifully with our baby carrier. Q. Did you find that it was easier to meet and talk with people when your infant daughter was traveling with you on Vancouver Island, compared to before kids? Yes, we found people to be extremely friendly. Having a baby is great conversation starter but then again, I am much more outgoing when I am with Ava. I enjoy talking with people who have kids and never hesitate to strike up a conversation. I guess it is the same as always … you tend to find what you are looking for, in that regard.